IPSWICH—Larger-than-life Hollywood icon Indiana Jones made Tom DeRosier want to be an archeologist. But after helping excavate a 140-year-old ship buried in Ipswich, the 20-year-old Salem State University student suspected his fictional inspiration would not have been able to keep up. DeRosier is one of 15 college students participating in a new pilot practicum offered through Salem State University, the Commonwealth’s Executive Office of Energy and Environmental Affairs, and area nonprofits. 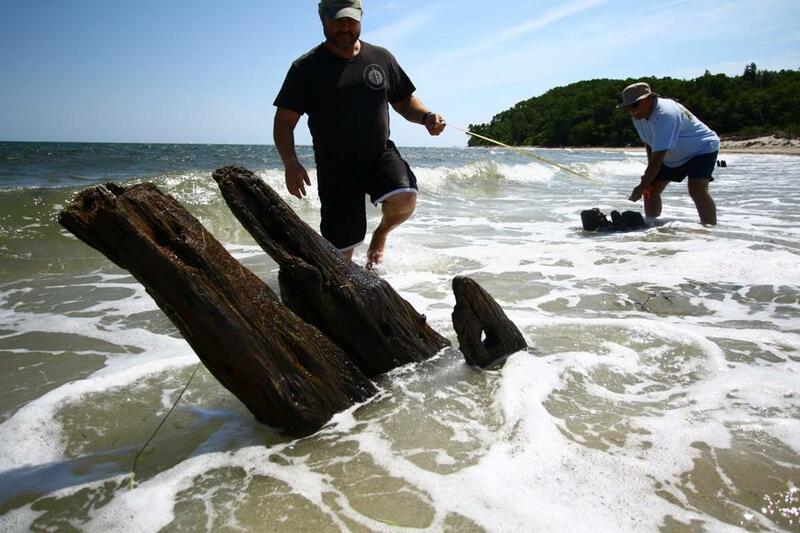 Students earned two college credits and an international archeology certification after completing four days of training, which concluded Thursday with the excavation of a shipwrecked vessel at Crane Beach in Ipswich. The group plans to explore other New England shipwrecks in the coming years, including one in Manchester Bay and one in Gloucester. The ship, named the Ada K. Damon, was destroyed on Dec. 26, 1909, after 72 mile-per-hour winds tore at its anchors, according to the Ipswich Historical Commission. It was abandoned on Crane Beach after Captain A. K. Brewster was unable to sell its parts, said Victor Mastone, chief archeologist with the Commonwealth’s energy office. Brewster lost everything he owned in the tempest, which was remembered as the “Great Christmas Snowstorm,” said Mastone. Over time, the sand at Crane Beach is moving toward the mainland, which has exposed the ship’s bowels and stern, Mastone said. The extent of what can be seen depends on the tide. Mastone said he believes the area could provide countless educational opportunities. The partnership among Salem State University, the state, and the students benefits all involved as well as the archeological sites. 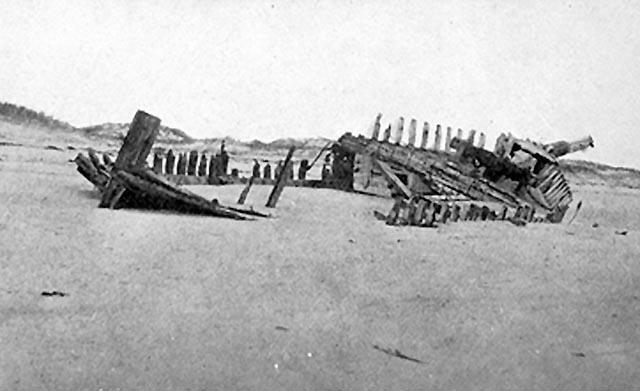 The Ada K. Damon immediately after wrecking on Crane Beach in December 1909. From "Sand Dunes and Salt Marshes" by Charles Wendell Townsend. The Commonwealth’s “one-man office” of archeological research receives much-needed help with fact-finding and exploration, he said, while the Crane Beach estate retains valuable information on the state of its artifacts. And students, many of whom had no maritime exploration experience, gain transferable skills. The training week also included a tour of a similar 19th-century ship, a trip to the Essex Shipbuilding Museum, and a discussion with a descendant of the Damon’s likely original builder, Ebenezer Burnham of Essex. His descendant, Harold Burnham of H.A. Burnham Boat Building & Design, spoke Thursday with the class. DeRosier said his classmates were amazed. Mastone taught the course with Laurel Seaborn and Calvin Mires, both experts in maritime history and archeology. Seaborn and Mires are instructors at SEAMAHP, the Seafaring Education and Maritime Archeological Heritage Program in New England. Mires said he expects SEAMAHP to bring maritime lessons to more Massachusetts students. Mastone’s office previously worked with high school students from New Mexico, but this program marked the first time it tailored maritime exploration and archeology to Massachusetts students. Mastone said he tried to emphasize the ship’s history and cultural significance to the region. This summer, Mastone’s office is also working with the Crane Beach summer camp to provide increased maritime educational opportunities for students in kindergarten through seventh grade. Field school leaders said they hope to expand to a monthlong program for middle school and high school students, with additional professional development for teachers. Mires said the training can help students in a wide range of areas. “We want to tap into their artistic side with freehand drawings, their math side with precise measurements, and their technical side with 3-D modeling,” he said. DeRosier said he left the training with that and more. Shipping was “in the blood” of the Northeast United States, he said, and this week was a good reminder. Plus, the professional experience of an on-site archeological dig will greatly enhance the college junior’s résumé. Translated: One man’s wreck is some student’s treasure. 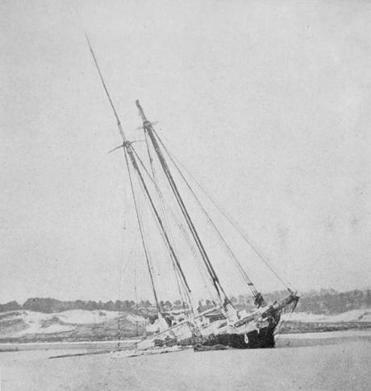 The Ada K. Damon one year after wrecking on Crane Beach. From "Sand Dunes and Salt Marshes" by Charles Wendell Townsend.